Why this quote from CS Lewis to open my story? I chose it to show the significant value of those that mean the world to us… our friends, family and mentors. Those that befriend and mentor us often teach us things that go against or are foreign to what we know because we are void of vision thus, filling that void with knowledge and wisdom. Why? Because often our improvement and growth is stunted as we choose to follow our intuition of the familiar, or void, rather than the unknown. To follow or pursue the unknown is to deny fear. To me, friendship is trust, love, comfort, education and edification, one to another… the things that give life value and guide us through our void and fears. Friendship is at its utmost, love… which bears all things, believes all things, hopes all things, and endures all things. So what of the man in this image? He is a man who was converted by Paul, becoming one of his closest friends and confidant. He was attributed to assisting in Paul’s letters, elected to oversee the growth of the church of Ephesus, accompanied Paul on his journeys, was his apprentice and most important, his friend… a friend who, as CS Lewis puts it gives “value to his survival”. He is Timothy. 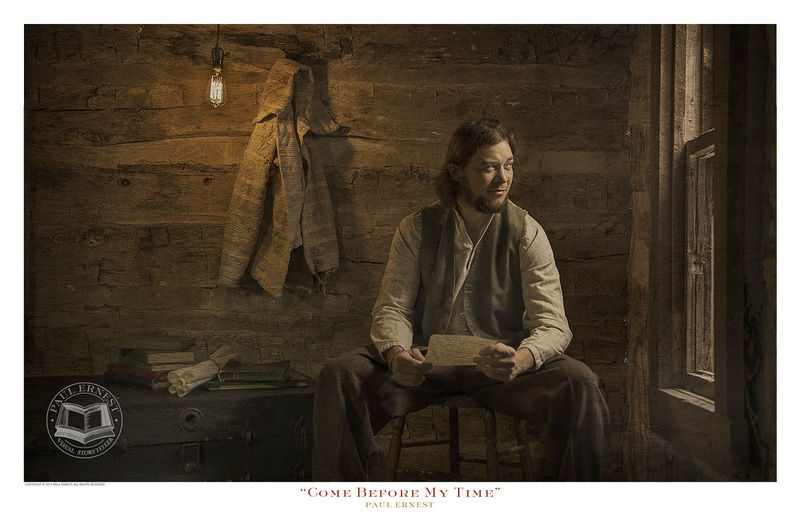 In this image, “Come Before My Time” we see Timothy reading a final letter from Paul… a letter we know as 2 Timothy. In Chapter 4 we see a short, but simple passage amidst Paul’s acknowledgements and admonitions, instructing Timothy to bring his personal and heartfelt belongings… His cloak, his parchments and his books. I need my cloak. I must have left it at the abode of Carpus at Troas… You’ll have no trouble spotting it, Timothy. It’s an old thing, but it’s been on my back through many a bitter winter. It’s been wet with the brine of the Great Sea; white with the snows of the rugged peaks of Pamphylia; gritty and brown from the dust of the Egnatian Way; and crimson with my own blood from that awful stoning at Lystra. The cloak is stained and torn, Timothy, but winter’s coming and I need the warmth it will bring. I also need my books, Timothy… don’t forget my books. You remember them. The ones I read under candlelight as we rode out the rough waters of the Aegean, endured the rigors of Macedonia together… those. Those scrolls that fed my mind and stretched me with fresh bursts of hope and stimulating ideas… bring along my books, my friend. Ahhh, but especially… tuck away the scrolls of the parchments. Those are my most treasured possessions… how I need the comfort of King David’s Psalms, the fortitude from the Prophet’s pens, the insights and perceptions from Solomon’s Proverbs… yes, the parchments, Timothy… the Parchments. Surely they will keep my heart warm and my hopes high in this desolate place. Timothy, I need you… Make every effort to come before my turn. Alone, in the privacy and company of Paul’s letter, Timothy is being petitioned for his presence and company… Paul is lonely and in need of not only a trusted friend, but his apprentice… a man who Paul considered his son. Paul needs the value of Timothy’s treasured friendship and the comfort he brings. How Timothy must have felt… helpless, knowing his mentor… a father to him, was acknowledging that his time is near… his martyrdom at the hands of Nero is to soon come. I can imagine Timothy as he is reading this… entering the unknown with faith as Paul has taught him, denying the fear that knocks at the door of his soul. Timothy is reminded of Paul’s words to seek love…even by those that would usher in Paul’s death… a love that bears and endures all things… even unto death. This was a love that was revealed to Paul on the road to Damascus at the time of his conversion… the love and forgiveness of Christ. So as Timothy glances out the window, I believe he is reflecting on their time together, restraining his fears, ushering in the words in this very letter that “God has not given us a spirit of fear, but of power and of love and of a sound mind”… to be joyful in ALL things, things of sorrow and happiness alike. The reason this pierces my heart is the very reason the Testament Collection exists… it helps us resonate with livings words written thousands of years ago. The duty I am taxed with in the Testament Collection is to take these people and their words and make them alive in their purpose and meaning so that people see the intent, message or moral and not a religious depiction… my call is to make their message relevant in the realm of our culture and our art. To me, every soul has a purpose and every purpose a story… I am a storyteller of people and their purpose. What is your purpose and story of your soul?